"That statement startled me and I've never forgotten it. I have kept that in mind each time I do a book. I try to have that element of surprise and fun in every drawing. This is why I never do any sketches beforehand, or plan ahead. My desire is that it happens for me in much the same way it happens to whoever will be looking at the book." (TTLG). 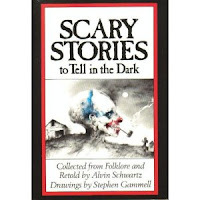 This week, the birthday celebration for Stephen Gammell had an "element of surprise". I was not surprised by the preplanned activity, but by who got excited about the idea. This week we had a morning that was beautiful and crisp. 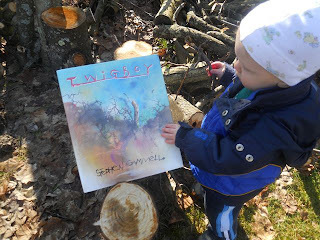 The sunlight was tapping my youngest son and I on the shoulder and begging for us to come outside as I read Twigboy by Stephen Gammell. The story begins in Weedland, not a good place for youngsters, with a group of bugs surrounding Twigboy (he is a twig!) -- and things didn't look good. Luckily, a rock bounds down from above and bowls over the bugs to save Twigboy. The rock, whose name becomes Rockwell, needs help from Twigboy after he falls into the slimy swamp and can't swim. The two adventurers form an instant friendship. After a visit to Granma and Granpa's and a good meal, the dynamic duo ignore a warning to stay away from Weedland when they decide to return to seek revenge on the bugs. I strapped on my son's shoes, zipped his coat, and grabbed a Sharpie market. 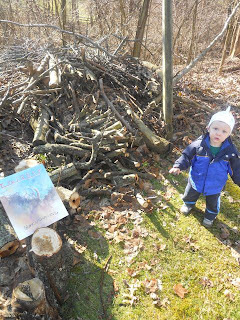 He chose his hat and carried the book. I told him that I was certain that Twigboy lived in our backyard and that we needed to find him. If Twigboy was going to live in our backyard this is where we would find him. After some searching, I found a stick that resembled Twigboy. Once I added the eyes and mouth with the black sharpie, I knew it was definitely him. I gave Twigboy to my son and asked if he could find him in the book. I helped him open the book and he found him right away. He also said something that sounded like "stick" without the /k/ sound. 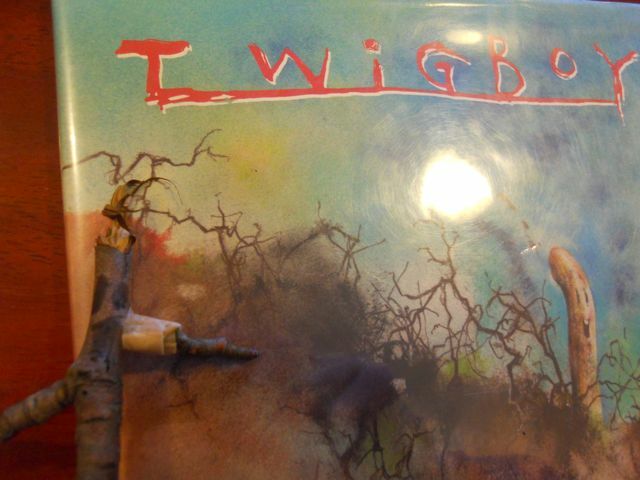 Twigboy! It is hard to notice his eyes and mouth that I drew with the Sharpie in this photo. I debated adding googily eyes later on, but I figured they would just fall or get picked off. I told him, "We need to find Rockwell." So we checked the front yard. He found his favorite rock and I added a face with the Sharpie. Now the friends were together again. Twigboy went with us to pick up my oldest son at preschool and somehow he lost an arm on the way back home. We tried a little glue, but it didn't help. I was very concerned for Twigboy. However, with the help of my oldest son we used a band-aid to attach his arm back on. This book had an ending that is very open ended. It begs for a sequel. 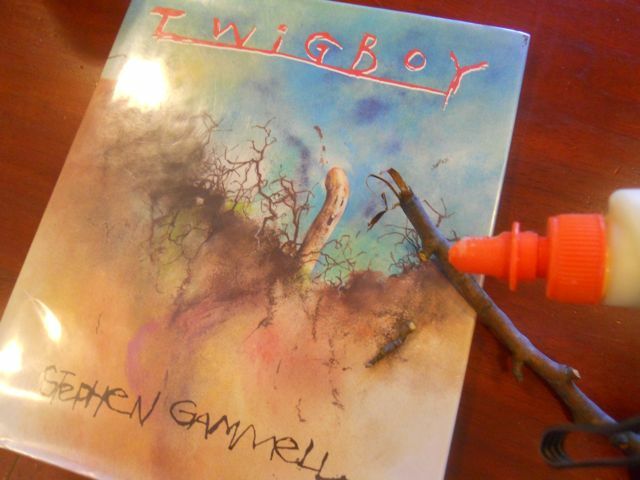 I think if we were to write "Twigboy 2" the band-aid would provide a very interesting plot twist! I am so pleased with how this birthday celebration turned out. I had originally planned to complete it with my older son when my youngest was napping. 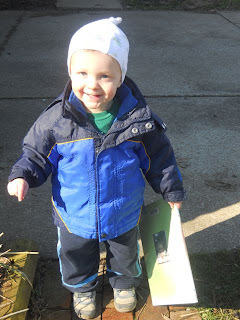 This reading experience has taught me that my son, even at only 20 months old, is capable of much more than I expected. I, too, am constantly amazed at how much the youngest "gets" out of activities that I originally planned for the older ones. Thanks for this great activity. I've never read Twigboy, but will be picking it up so the Kessler Kids can go on a search to find him and Rockwell in our yard. Twigboy and Rockwell said they were headed over to your house! I am now a new Gammell fan. Loved the book trailer, thanks for sharing Eric. Jennifer, I felt the same way when I saw the trailer for Mudkin! That looks like a great book Eric. And your son is particularly cute! Anna, Thanks so much for recognizing my blog. Did you start the Kreativ award? No problem, I'm really enjoying it :) No, I didn't start it - Kirsten Larson from 12x12 passed it to me, but I don't think it's been doing the rounds as much as the Liebster has! Anna, Thanks again for the award. I don't know where the Liebster award originated either. Another great author, another great blog post! At the risk of being repetitious, you are just such a great dad and your activities are absolutely awesome! Sandra, I don't mind that you are repetitious! Thanks for sharing the post once again! What a cool birthday celebration! I love the simplicity of it. 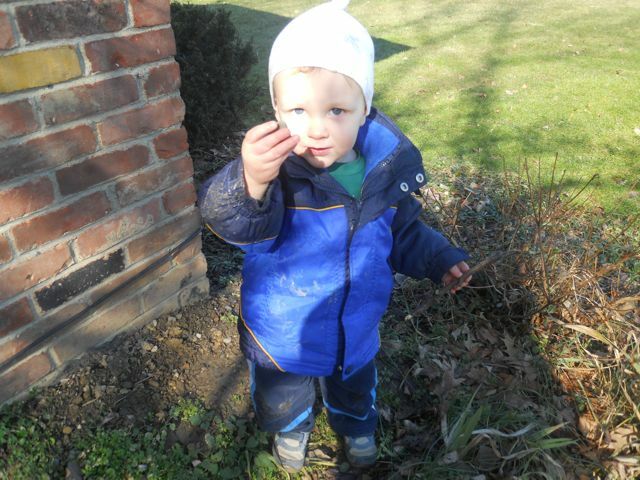 Sticks and rocks are the heart of any little boy's playground. 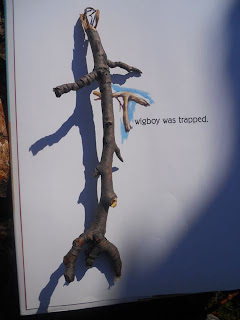 I'm going to have to read Twigboy to my boys and we're going to have to make some of our own, "Twigboys." My boys will love it! I think the simplicity of the activity was why I liked it too. 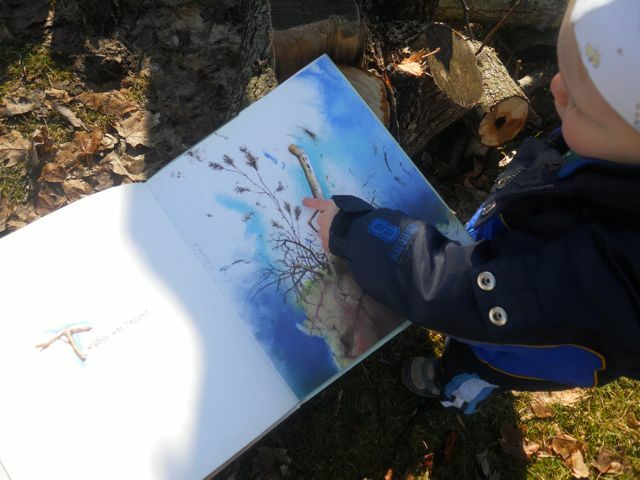 My son was just so thrilled to match his Twigboy to the one in the book. I would love to hear about your Twigboy adventures with your boys! Thanks again for reading my blog!